BackgroundThere has been an increasing trend in the incidence of stroke worldwide in recent years, and the number of studies focusing on the risk factors for stroke has also increased every year. To comprehensively evaluate the risk factors of stroke identified in prospective Western and Asian cohort studies.MethodsPopulation-based cohort studies on stroke were searched in databases (PubMed, EMBASE, Web of Science, Google Scholar, etc. ), and the library of the Third Military Medical University was manually searched for relevant information. A meta-analysis of Western and Asian studies on risk factors was performed. The pooled hazard ratios (HRs) with 95% confidence intervals (CIs) were calculated to assess the final group of cohort studies.ResultsAfter screening, 22 prospective cohort studies were included in the analyses of this investigation. Two factors, smoking and alcohol consumption, showed statistically significant differences between Western and Asian populations, and the results were as follows (W/A): 2.05 (95% CI, 1.68 ~ 2.49)/1.27 (95% CI, 1.04 ~ 1.55) and 0.89 (95% CI, 0.76 ~ 1.04)/1.28 (95% CI, 1.07 ~ 1.53). The factor BMI = 18.5-21.9 kg/m2 showed statistically significant differences only in Western populations, 0.96 (95% CI, 0.93 ~ 0.99); the factor SBP = 120-139 mm Hg showed statistically significant differences only in Asian populations, 2.29 (95% CI, 1.04 ~ 5.09).ConclusionsThe prevalences of risk factors affect the stroke morbidity in Western and Asian populations, which may be biased by race. 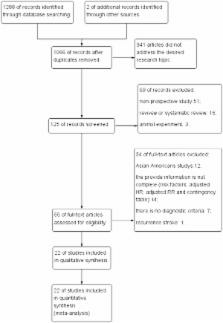 The meta-analysis of population-based studies suggests that different preventive measures should be adopted for Western and Asian population groups that are at high risk for stroke.Electronic supplementary materialThe online version of this article (doi:10.1186/1471-2458-14-776) contains supplementary material, which is available to authorized users. Critical evaluation of the Newcastle-Ottawa scale for the assessment of the quality of nonrandomized studies in meta-analyses. Although more than 80% of the global burden of cardiovascular disease occurs in low-income and middle-income countries, knowledge of the importance of risk factors is largely derived from developed countries. Therefore, the effect of such factors on risk of coronary heart disease in most regions of the world is unknown. We established a standardised case-control study of acute myocardial infarction in 52 countries, representing every inhabited continent. 15152 cases and 14820 controls were enrolled. The relation of smoking, history of hypertension or diabetes, waist/hip ratio, dietary patterns, physical activity, consumption of alcohol, blood apolipoproteins (Apo), and psychosocial factors to myocardial infarction are reported here. Odds ratios and their 99% CIs for the association of risk factors to myocardial infarction and their population attributable risks (PAR) were calculated. Smoking (odds ratio 2.87 for current vs never, PAR 35.7% for current and former vs never), raised ApoB/ApoA1 ratio (3.25 for top vs lowest quintile, PAR 49.2% for top four quintiles vs lowest quintile), history of hypertension (1.91, PAR 17.9%), diabetes (2.37, PAR 9.9%), abdominal obesity (1.12 for top vs lowest tertile and 1.62 for middle vs lowest tertile, PAR 20.1% for top two tertiles vs lowest tertile), psychosocial factors (2.67, PAR 32.5%), daily consumption of fruits and vegetables (0.70, PAR 13.7% for lack of daily consumption), regular alcohol consumption (0.91, PAR 6.7%), and regular physical activity (0.86, PAR 12.2%), were all significantly related to acute myocardial infarction (p<0.0001 for all risk factors and p=0.03 for alcohol). These associations were noted in men and women, old and young, and in all regions of the world. Collectively, these nine risk factors accounted for 90% of the PAR in men and 94% in women. Abnormal lipids, smoking, hypertension, diabetes, abdominal obesity, psychosocial factors, consumption of fruits, vegetables, and alcohol, and regular physical activity account for most of the risk of myocardial infarction worldwide in both sexes and at all ages in all regions. This finding suggests that approaches to prevention can be based on similar principles worldwide and have the potential to prevent most premature cases of myocardial infarction. Abnormal MGMT promoter methylation may contribute to the risk of esophageal cancer: a meta-analysis of cohort studies. Lack of effects of dietary folate intake on risk of breast cancer: an updated meta-analysis of prospective studies.